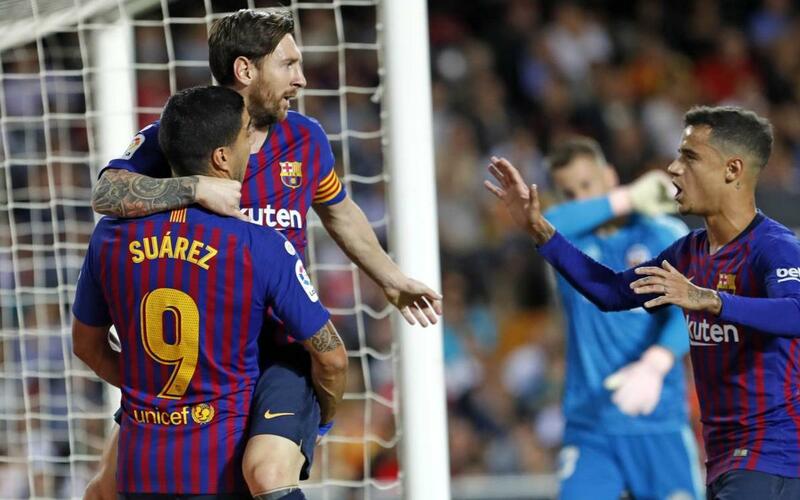 A raucous atmosphere greeted Barça at the Mestalla, and Valencia responded by starting on the front foot and scoring from their first corner through Garay. The Blaugrana quickly settled into the game thereafter, and began to stroke the ball around with ease. With Arthur and Philippe Coutinho beginning to dictate the rhythm in a crowded midfield, Los Che were reduced to playing on the counter attack. Lionel Messi would have Barça’s first shot on target on 20 minutes, as pressure continued to be exerted by the visitors in and around the Valencia penalty area. Just two minutes later, Barça’s captain rifled in from distance to bring them back on level terms, which was no less than they deserved. An open and entertaining game saw chances at both ends before half-time, with Ernesto Valverde’s side enjoying the lion’s share of possession. The pattern remained the same after the break with Barça setting the pace. Coutinho went close on 50, before some wonderful movement and inter-play saw Messi get another on target. By this point, the hosts were offering very little in the way of attacking thrust, save for the occasional foray upfield. Both teams were looking to use the pace of their wide players to get in behind, and Ousmane Dembélé replaced Coutinho with seven minutes left to play to give Barça more impetus in that part of the pitch. In the end, both defences came out on top, with no further chances of note.